A delegation of Central Secretariat Service (CSS) officers, led by Senior Vice-President CSS Group ‘A’ Officers Association, Shri J.B. Sharma and other office bearers, called on Union Minister of State (Independent Charge) for Development of North Eastern Region (DoNER), MoS PMO, Personnel, Public Grievances, Pensions, Atomic Energy and Space, Dr Jitendra Singh here on Monday, August 28, 2017 and pleaded their case for timely promotion which, according to them, had got unduly delayed. As per the memorandum submitted by the delegation, the Deputy Secretaries of SL-2012, attained eligibility for promotion as Director with effect from 1st July, 2017 but the meeting of the Departmental Promotion Committee (DPC) was due for being convened. Dr Jitendra Singh gave a patient hearing to the officers and the members of the delegation. He said, the DoPT will examine all the facts and take a view accordingly. 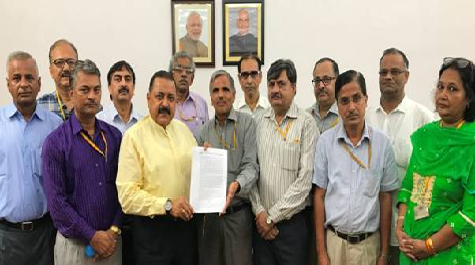 Union Minister of State (Independent Charge) for Development of North Eastern Region (DoNER), MoS PMO, Personnel, Public Grievances, Pensions, Atomic Energy and Space, Dr Jitendra Singh receiving a memorandum from a delegation of Central Secretariat Service (CSS) Officers’ Association in New Delhi on Monday, August 28, 2017.